The “Scream” is the most famous painting of Edvard Munch. Aesthetically this painting is not in my taste, but the emotion that it expresses speaks volumes to me. I actually can relate so much to Munch. He grew up in a very strict family, with fear as tool of obedience. 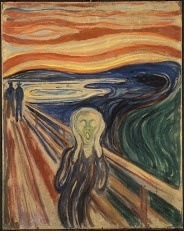 It was no surprise to me, this painting the “Scream” was a direct result to a broken Heart. His first love, was actually his sister in-law (no blood relation) who was married, and she left him for someone else. She was the love of his life, and several of his paintings depicted the torture he endured by loving her. The interesting thing about this painting is, at first glance you would assume the center character is the one screaming. However, this is not so, the character is actually in sheer horror due to the scream of nature. The bright red colors and swirls of movement represent the nature at its cruelest. Notice the two people in the background behave like nothing is wrong in the background. For me this clear evidence, the Scream he speaks of is that of SILENCE. I know this, because I have felt this before at my lowest. Lost love is all about silence. You can no longer speak, you must be silent, you can no longer hear their voice because they are silent, you are breaking inside, but all you hear is SILENCE. It is like being the walking dead. Nobody around you can hear this cry, but you can. You feel you have gone half mad, and yet the world around you ,moves on peacefully. Munch powerfully depicts a person at their breaking moment, it is unfortunate such a deep painting has turned so commercial.